NOTTINGHAM: England captain Eoin Morgan praised Chris Woakes, Jos Buttler and Liam Plunkett for getting his side “out of a hole” as the first one-day international against Sri Lanka ended in a thrilling tie. 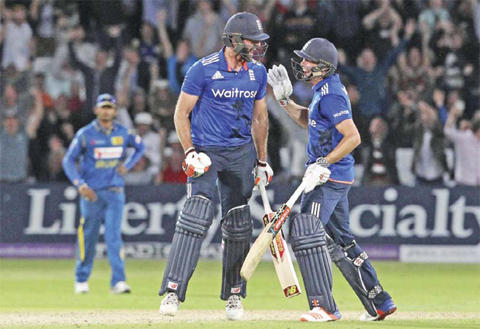 Set 287 to win, England collapsed to 30 for four and 82 for six in Nottingham on Tuesday. But a stand of 138 between Buttler (93) and man-of-the-match Woakes, who made 95 not out-the highest ODI score by any number eight batsman-revived the innings. England’s hopes of victory disappeared in a final over where they needed 14 to win in front of a capacity crowd at a floodlit Trent Bridge. However, with six required to tie off the last ball, tailender Plunkett drove Nuwan Pradeep over long-off to seal the tie, in what was a stunning start to the fivematch series. This was Plunkett’s first match at this level since September, but the fast bowler said he was confident his reputation as a big hitter in county cricket would be maintained on the international stage. “I was telling myself I have been hitting it well for Yorkshire-’stay still and hope I get enough on it to get it out of the ground’,” said Plunkett.